January 22 is the commemoration day of Blessed Laura Vicuña, but since this year January 22 is a Sunday, we celebrate it today. She was a pupil at one of our schools in Argentina in the early 1900s. By all standards, Laura didn’t have an easy life. Some might even say that, as a young girl, she had a lot on her plate. The factors for a “successful” life weren’t “in her cards”. So why is she remembered and held as a model for adolescents and youth? 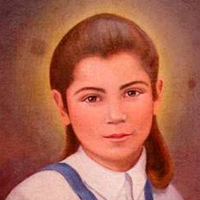 As I remember this amazing adolescent who, at such a tender age, had understood that to love is to offer one’s life so that the beloved may have true life, I cannot help but ask myself, what does Laura’s life teach me as a Salesian educator? What lessons do I learn from Laura Vicuña’s life? Lesson number 1: I do not educate alone. Education is more efficacious when done in synergy and when the environment itself offers a space where education is possible. Our educational settings must be places where young people feel that they matter, that they are accepted with their limits and possibilities, but with trust in the presence of good in each one. Lesson number 2: I should have the guts to show them to strive for something more. Young people have great hearts capable of aiming high. We do them injustice when what we offer is mediocrity. Lesson number 3: Simple and ordinary are exciting, too. We have practices and traditions that some might think outdated, but in reality they help to form convictions and habits. Our Salesian spirituality offer a view of life that is positive and full of hope. We do not need big events to have an exciting life. What makes us happy is not when we are focused on ourselves but when we share and serve others. Looking at Jesus, listening to His Word and being nourished by the Eucharist will help me become a “person for others”, and this is the secret of joy. We need idols, people whose lives show us that yes, aiming high is possible, being good is cool, because in the end it lasts. Mother Mary is for us not only a mother, but an all-time-model. Laura Vicuña reminds me to believe in the young. They have good hearts. They desire to have meaningful lives. With young people, we are called to be missionaries of hope and of joy.